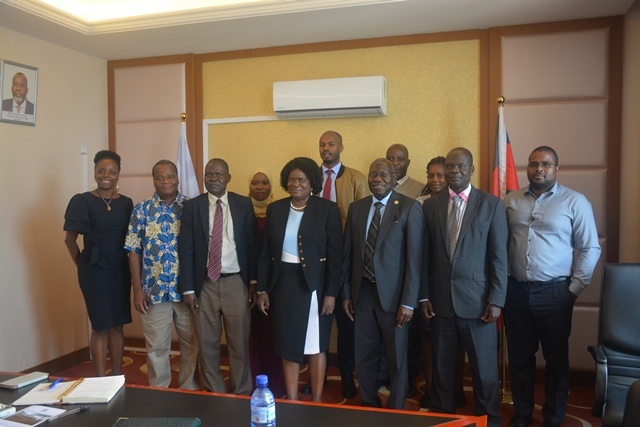 Uganda’s Mbarara University of Science and Technology (Uganda MUST) and Malawi University of Science and Technology (MUST Malawi) on January 30 held a round table meeting to explore areas of common interest for future cooperation. Led by Vice Chancellor Professor Celestino Obua, the Mbarara University team shared their experiences and milestones in science and technology for the past 29 years. Among others, MUST Uganda is recognised for its research and innovations in the medical field, areas that are also at the heart of the MUST Malawi. Professor Obua said the two universities do not only share names but have common interest in a number of areas, especially in vision, programmes and research interests. “We are ready to partner with MUST Malawi in areas of muitual interest. However, we are looking at a robust and enduring relationship that goes beyond signatures in MoU documents,” he said. Professor Obua also highlighted areas that would help both universities develop. For instance, he encouraged MUST to venture into herbal medicine research, promoting research by women, and intensifying student and faculty exchang programmes. In her remarks, host Vice Chancellor Address Malata said the partnership with Mbarara University would be more beneficial to MUST, considering that it is still new and young. “We can currently be excused because we are Malawi’s newest and youngest public university but we know that soon that will not hold with government’s plan to unbundle the University of Malawi into three independent universities. As such, we need to start translating our vision, mission statement and core values into action by looking global. One way of doing that is through partnerships with those who have been around for some time and have different perspectives to things,” she said. Mbarara University of Science and Technology is Uganda’s second public university and among other programmes, it offers medical, ICT, engineering and education programmes. Apart from the discussions, the Mbarara University team, which also had Vincent Kwatampora Kansiime, Associate Professor Samuel Maling and Edith Wakida, also took a tour of the MUST campus. The tour took them to the administration block, library, lecture rooms, laboratories and teaching hospital.